Luxury accommodation on this exotic island comes in great variety and the 60 km west coast is where 90% of its most popular and best beaches lie. 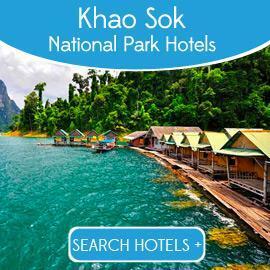 Along them, top 5 star hotels in Phuket are wrapped in idyllic nature spoiling with captivating views interrupted only by small islands on the horizon. 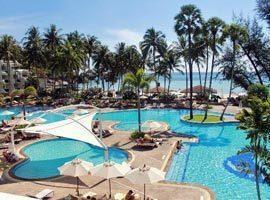 The good news is we offer the guaranteed best all inclusive prices for all of them. The 2nd choice the island allow in great variety is the setting in which you want to wake up in the morning and how near you want to be to commercial activity. 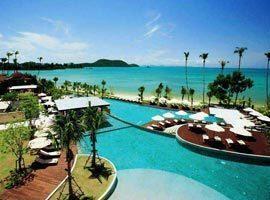 Looking at a map of Phuket, Patong is in the centre of the west coast. It is an explosion of activity, cosmopolitan and where the primary nightlife scene resides. The further north or south from here the more tranquil it becomes. Needless to say that besides choosing the right hotel for your particular requirements, the best area to stay in Phuket is as important. 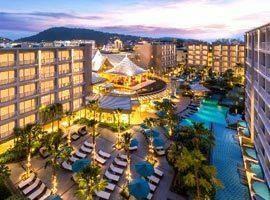 You don't want to look for 5 star accommodation deals at top luxury resorts in Patong Beach if you prefer a quiet location and similarly do not want to be feel secluded if you prefer to mingle in the exotic nightlife scene. To your left under "Featured Places" we offer information about suggested areas and list popular hotels in each for which we guarantee great deals. Located on a private beach Anantara Layan is ideal for families and couples featuring private sea view pool villas with up to 5 bedrooms sleeping 10 persons, a kids club and beachfront swimming pool. Featuring a kids club, personal chef and villas with 1 to 3 bedrooms equipped with pools, and allowing ocean views from your bed or while soaking in your spa bath tub Andara settles on a cliff-side in Kamala. Surrounded by lagoons Angsana Laguna faces the sea in Bangtao Bay. It offers extensive recreational facilities including access to a golf course, a 300 meter pool, kids club and boat shuttles to boutique shops. Located in a private corner of Karon Beach Centara Grand features a beachfront water park with 4 pools and child entertainment programs. 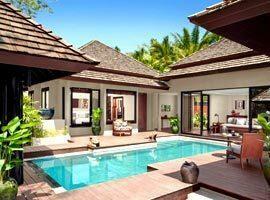 It offers ocean facing spa and pool suites and 2 bedroom villas. This luxury hotel near entertainment featuring 3 pools with swim up bar offers direct pool access rooms and suites with private balconies, free standing tubs and some with glass encased bathrooms. 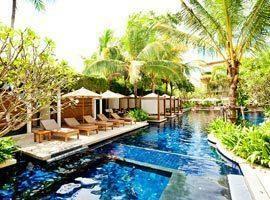 Indigo Pearl is situated on secluded Nai Yang Beach and offers exquisitely decorated pool suites. 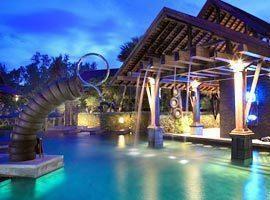 It features an unique rain forest spa with private cocoon-like treatment rooms suspended mid-air. 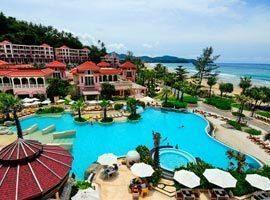 With a privileged location in aptly called Relax Bay this popular hotel with a private beach is moments from Karon or Patong. 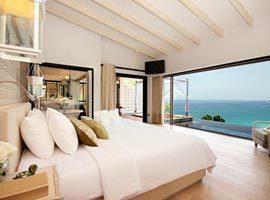 It features stylish sea view rooms and 2 bedroom suites sleeping 4 persons. Across the street from the beach in Karon, Movenpick offers many accommodation options from penthouse pool suites to 2 and 3 bedroom suites and residences with their own separate pool. 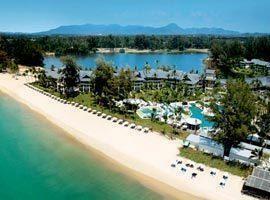 Settling on the water's edge and next to a placid lagoon the resort is located in Bangtao and offers rooms with private balconies extending over the beach as well as 2 bedroom family villas and kids club. 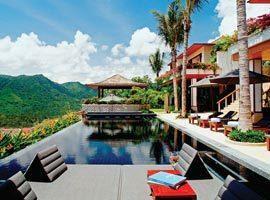 Set on the slopes of a jungle covered hill with views of Kamala Bay Paresa is a secluded hideaway. The most luxurious pool suites and private dinners surrounded by forest and candles sets a romantic mood. 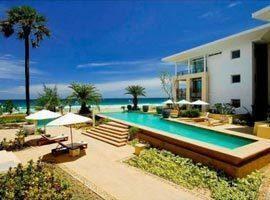 Set against the beach overlooking the dramatic scenery of the Panwa Peninsula. 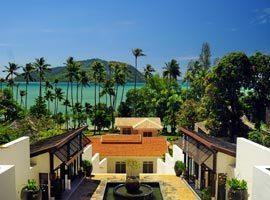 Hidden from crowds the resort is near Phuket Town featuring a beachfront pool with swim up bar, kids club and award winning spa. 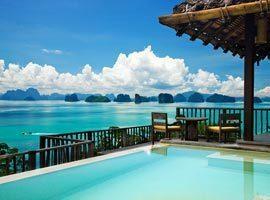 Escape the crowds and enjoy a romantic break in secluded Mai Khao. Yet, with 3 bedroom family accommodation featuring your own pool and a kids club it is also ideal for a luxury family getaway. The most authentic and romantic island lifestyle experience on Yao Yai, an island which maintain its original charms and pristine nature a moment's boat ride from Phuket's Ao Por Grand Marina Pier. Stunning views over mystical Phan Nga Bay with lime stone karts dotting the ocean's surface from rustic, yet luxurious villas in a tropical forest where personal butlers tend to your every desire. Located in Surin near the Catch Beach Club and Surin Plaza shopping mall The Chava offers spacious 2 to 5 bedroom apartment style accommodation which feature full kitchens, dining and living areas. Offering seaside dining and amazing spa this adults only hotel is the ideal honeymoon destination located on intimate Kata Noi Beach. 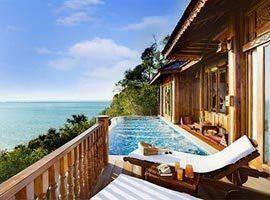 It allows exceptional views of the stunning bay right from your own pool. 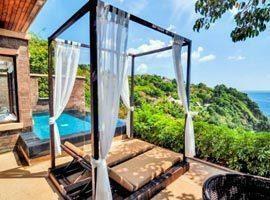 Located between the foot of a lush hill and a tranquil ribbon of sand in Pansea Bay Surin area this hideaway feature intimate hillside cottages with sea views, beachfront suites and 2 bedroom cottages. Located in Rawai you can live the tropical high-life in charming stand alone bungalows right next to the sea and soak in seclusion in our own pool with views of spectacular Phang Nga bay.